This lovely two-bedroom retirement bungalow is set in a quiet cul-de-sac location of similar properties, close to shops, medical facilities and transport links and has the added advantage of being completely refurbished. EPC rating TBA DESCRIPTION This lovely retirement bungalow is set in a quiet cul-de-sac location of similar properties, close to shops, medical facilities and transport links and has the added advantage of being completely refurbished. A door to the side leads into the main entrance hall with doors to all rooms and a useful storage cupboard. The generous lounge is to the front and has a further door leading into the new cream-gloss fitted kitchen, with a range of wall and base units with worktops over, electric oven with halogen hob and extractor hood over and space for washing machine. 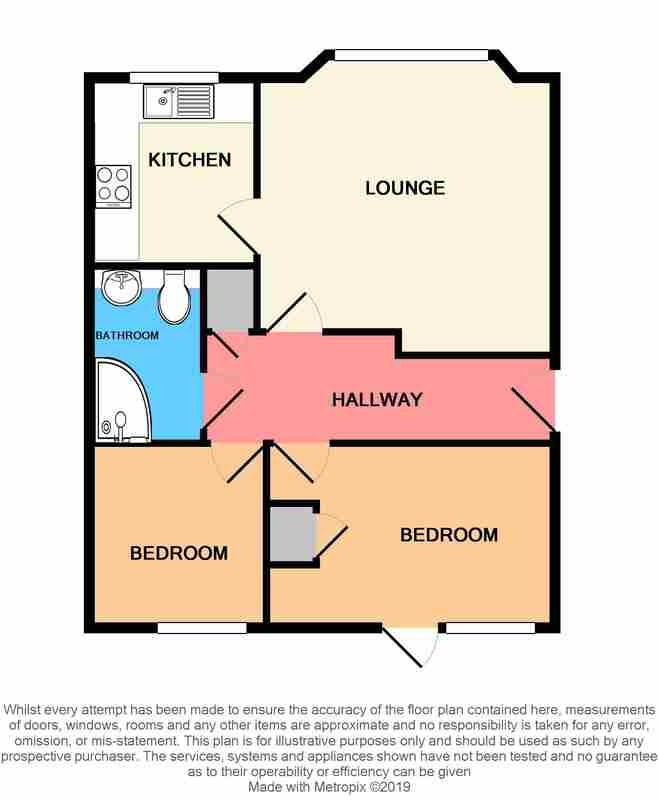 There are two bedrooms, the main bedroom having a door that leads out onto the patio and into the rear garden. The new bathroom consists of a curved-glass corner shower with electric shower, units with inset sink and WC and mirrored wall cabinet with vanity lighting. There is also a light tube which keeps natural light coming in during the day. The rear garden is nice and private and benefits from a good-sized patio area, a lawned area, an outside tap, timber store shed and a side gate leading to the front. The property is heated using electric night-storage heaters for safety as these properties are for over 60's only. SITUATION Backwell is a suburban village south west of Bristol, on the A370 to Weston-super-Mare. It includes the hamlets of Backwell Common, Backwell Green and Farleigh. Nearby are Nailsea, Flax Bourton, Yatton, Brockley and Barrow Gurney. Backwell Lake is next to the road between Nailsea and Backwell and is just north of the railway station. The village has a long history, appearing in the Domesday Book in 1086 with the name 'Bacoile' meaning 'The well back on the hill'. The well is still in existence. Many residents of Backwell commute daily to Bristol by car via the A370, bus or train - the railway station has a direct service to London. Backwell is close to the M5 motorway and Bristol International Airport at Lulsgate is 3 miles (4.8 km) away by road. The airport serves both domestic and international routes, and is one of EasyJet's hub airports. Backwell has excellent junior and secondary schools; the largest junior school is Backwell Church of England Junior School, which is highly praised by Ofsted and performs consistently well in the league tables, and secondary school Backwell School, consistently features high in the league tables for GCSE results, and is recognised as one of the best state schools in North Somerset. DIRECTIONS From the Debbie Fortune office in Backwell proceed up Dark Lane and the second turn on the right is Summerlands and the property is halfway down on the right-hand side. WE HAVE NOTICED A fantastic example of these very popular bungalows that is all ready to move in to as its been fully refurbished. With the advantage of being in a great location in the sought-after village of Backwell and also having the shop, post office and medical facilities near-by this is an ideal choice for retirement.